The objective for any technology in education is to support, motivate and enhance student learning. Technology has the capability, if used appropriately, to transform what is happening in the classroom. When considering what technology to use in a classroom, the first question is “what do you want to do?” Once the learning objective has been defined, then you choose the technology to use. Sign up to get invited to future Technology Salons! As part of the Technology Salon, a list of resources around the topic was created to serve as a reference about ICT4E in Rwanda. Many ICT4E initiatives are being implemented in Rwanda. 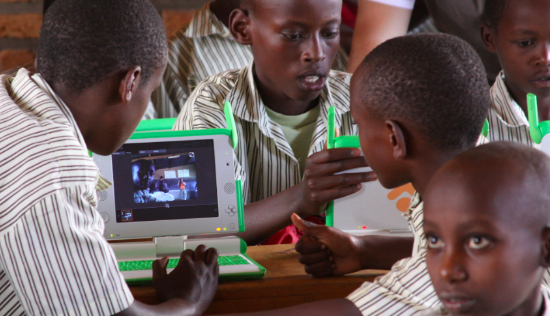 Let’s look at how the Rwanda Education Commons, an online platform, TeacherMate, handheld computers focused on literacy and XO laptops from OLPC are being used for learning in Rwanda. ICT is supported at national levels in Rwanda from Vision 2020 which seeks to transform Rwanda into a middle-income country and a knowledge-based society by 2020 to the National Information and Communication Infrastructure (NICI) strategy which has ICT as the guiding policy to develop the Rwanda information and knowledge economy to the Ministry of Education’s ICT in Education policy to integrate ICT at all educational institutions, at all levels. The Rwanda Education Commons (REC) was a USAID funded initiative with the Rwanda Ministry of Education (MOE), implemented by FHI 360 to promote the effective use of ICTs in education. In partnership with the MOE, REC expanded access to quality education by building communities of educators around the sharing of educational materials and resources. MOE was involved from the inception of the project, local staff were all Rwandan, and the project was housed and embedded within MOE’s offices. In policy, REC catalyzed Rwanda’s first ICT in Education policy. In education content, REC built a digital library containing materials supporting each unit in Rwanda’s secondary school curriculum and some of Rwanda’s primary school curriculum. The materials are a mix of locally produced content, regionally adapted content, and relevant, internationally sourced content. In hardware and software, REC connected all of Rwanda’s teacher training colleges to the internet and negotiated the subsidy of bandwidth. Plans were made to sustain and support the infrastructure. In partnership with Google, REC build an online teacher community platform in which Rwandan teachers took part. In teacher professional development, REC launched the teacher community, a training-of-trainers model for improving technological literacy, and a television program broadcasting good teaching practices in Rwanda’s classrooms. Of course with any online application, there is the issue of bandwidth and infrastructure. The design and implementation of REC was initially based on assumption that there would be a fiber optic network in place throughout the country. With that network in place, access to the internet would have been reliable and affordable. However, until recently, few have had access to broadband. During the project, REC negotiated the subsidy of bandwidth for the teacher training colleges. The infrastructure that REC was initially built on was an open source portal platform. In 2010 REC received support from Google to create a platform in a low bandwidth environment, and online community was revamped using Google tools. At teacher training colleges, many teachers were not computer literate when the project began. The project provided training to use technology and the REC platform at the teacher training colleges. As confidence grew, the use of REC for discussions, sharing information and accessing resources increased. Using technology moved from zero understanding to a basic competency. All teachers at the teacher training colleges used the portal. Coaches at the colleges now provide further training. A discussant questioned about “teacher incentives and if teacher professional development is needed? People learn to use Facebook without any training.” ICT in education involves content, pedagogy and technology. Teachers use the technology when they see the value in it. It takes time to change behavior and attitude. It is not about knowing how to use the technology but about applying it. Jacques Murinda described two activities that OLE Rwanda is currently implementing. TeacherMate is an application and tool that has pre-set lessons on literacy. OLE is working with Innovations for Learning, an organization that uses digital learning applications to improving student literacy, who created the TeacherMate. The OLPCs are being used to develop and remix open content for project learning activities. A question asked was “which is better: the TeacherMate to OLPC?” Comparing the two would be like “comparing a cow to a goat.” In other words, you can’t, and you shouldn’t. The objective and use of each one in the classroom is different. With the Teachermate the students engage with the content on one topic. The OLPC is creative, experimental and self-directed. The Teachermate is game-based engagement. Teachers introduced the technology into the pedagogy and are using it as part of lessons with their students. The students learn the lesson and pass the test. It takes planning to decide how to use the OLPC in what classroom and context. With the OLPC the teacher become more like a facilitator in the classroom, and the potential for learning shifts and expands. Comparing TeacherMates to OLPCs is like comparing a cow to a goat. Different learning objectives. Different uses. Different technology. Technology is tricky to implement in schools. How do you deal with infrastructure? Networking? Security? Cybersecurity? What constitutes good teacher professional development? How can a teacher create an environment so students can learn? What minimal conditions at schools are needed for technology to work? Many decisions need to be made putting technology into schools. The portal for REC is now managed by the Rwanda Education Board. An option that has been discussed is to decentralize REC to teacher colleges. Although from the onset there was government buy-in and steps were taken for the government sustaining REC, more planning would have been better. Overall REC has gotten good reception, and there is agreement that it should continue. Although REC is used by pre-service teachers, more efforts are needed to sensitize and encourage in-service teachers to use it. Everyone wants to know the quantitative results for using TeacherMate and OLPC in the classroom. For the TeacherMates, results from EGRA for the 2011 school year show literacy skills have tripled. It is encouraging yet the projects are really just starting. Investments in education take a long time to grow and show results in student learning. A qualitative result that needs to recognized is that changes in habits of students have occurred at the schools. They are more excited and willing to learn. They want to come to school. Isn’t it great that a child attends school regularly and wants to learn? The question about using technology in education, as in any sector, is “what do you want to do?” Until that question is answered appropriately, we will still be trying to compare cows to goats. This post was written by Jodi Lis, who works for FHI 360, the organization that implemented the Rwanda Education Commons project.